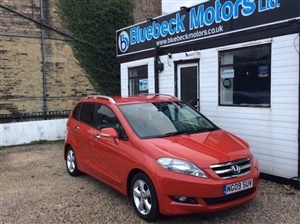 Red, A tidy example of a Honda FR-V edit 1.8 i-VTEC EX 5dr in red, on the vcar register(CAT N) , light damage repaired to a high standard, low miles, 6 seater-ideal family car, call our sales team for a viewing or test drive on 07724444414 / 01924 470090, 1 owner, Good bodywork, Interior - Clean Condition, Tyre condition Good, Climate Control, Cruise Control, Alarm, Alloy Wheels (16in), Computer, Electric Windows (Front/Rear), In Car Entertainment (Radio/CD), Rain Sensor, Tinted Glass, Body Coloured Bumpers, Heated seats, Central Door Locking, Leather seats. 6 seats, WE ACCEPT ALL MAJOR DEBIT & CREDIT CARDS. A DEPOSIT SECURES THE SALE OF THE VEHICLE.